It is very likely that you or someone you know has a family member with Alzheimer’s Disease (AD). Today is World Alzheimer's Day, a day on which Alzheimer's organizations around the world concentrate their efforts on raising awareness about Alzheimer's and dementia. AD is the most common form of dementia, a group of disorders that impairs mental functioning and is the main cause of death of over one in three seniors today. Since Alzheimer's has no cure and it gradually renders people incapable of tending for their own needs, care giving is essentially the treatment and must be carefully managed over the course of the disease. If you are a caregiver we would like to recognize you and encourage that you take some time today of reflection and self love. According to the Alzheimer’s Association, In 2016, 15.9 million family caregivers provided an estimated 18.2 billion hours, that is a lot of time where we focus our energy on the well being of others and can often mean neglecting our own. Here are some things to consider for optimizing our brain health and improve our self-care. Recognize all of the time and effort that you put into their care. Some other activities to optimize brain health! Caring for someone is one of the most rewarding human interactions, take care of yourself to show up to the world for the people we love. 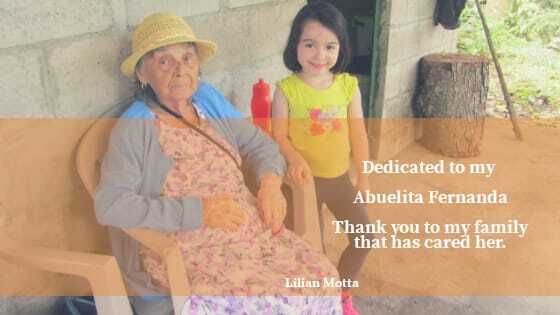 Blog Written by Co-Founder Lilian Motta, dedicated to my Abuelita Fernanda. Older PostWhen is the right time to talk about mental health?